If single Drakensberg Grand Traverse is not enough, how about a double? 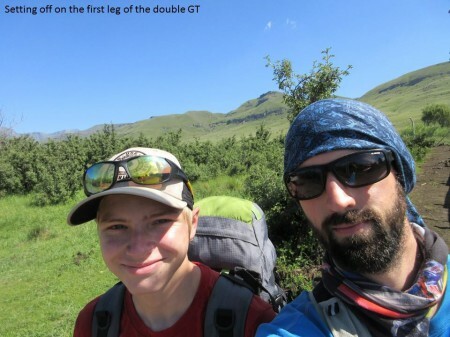 Over New Year Jonathan Newman and Mike van Wyngaard did a back-to-back Drakensberg Grand Traverse. They started with a South-to-North route, a few days off and then a North-to-South route. Andrew Porter, holder of the solo FKT, joined them for the return journey. Shortly after completing the double GT he wrote, “So a double Drakensberg Grand Traverse can actually be done – but it is much harder than one might expect. About 450km in a total time of 15 days 7 hours 50 minutes”. For DGT times and records, visit this FEATs on Foot page.